Pom Pom Trim Crinkle Maxi Dress is rated 4.1 out of 5 by 9. Add a little vibrancy to your wardrobe with this crinkle maxi dress. Made from a delightful, lightweight material and featuring a tie back, pompom trim detail at the sleeves, this dress is perfect for a daytime summer look. The gathered waistband cinches the waist, accentuating your curves and creating the illusion of the perfect hourglass figure, meanwhile the stunning shade of teal promises to warm up your complexion. Rated 5 out of 5 by Sonny from Nice dress I originally brought this dress in a size 22, my usual size but returned it because it was too big. Reordered a size 20 and it fits lovely. Rated 1 out of 5 by Crinkle dress from What a disappointment. I ordered this expecting a teal colour dress. Unfortuntely, it was a darker drabber colour. The dress was huge. It had no redeeming features as far as I could see. I returned it very quickly. Rated 4 out of 5 by Suzanne72 from Lovely dress So comfortable and lovely rich colour. Had lots of comments when I've worn it for work. Rated 5 out of 5 by KannF12 from Great dress! This dress is easy to wear, comfortable, yet stylish. Ideal for summer days or nights as can be dressed up or down, and very flattering too! Rated 3 out of 5 by Sonny from Nice dress The colour was more of a green than teal, so returned the dress. but I did by one in the lighter colour and it is lovely. Rated 4 out of 5 by Eviekb from A very complimenting dress This dress is very complimenting for a fuller figure, it hugs the right places without putting emphasis on the more undesirable areas. 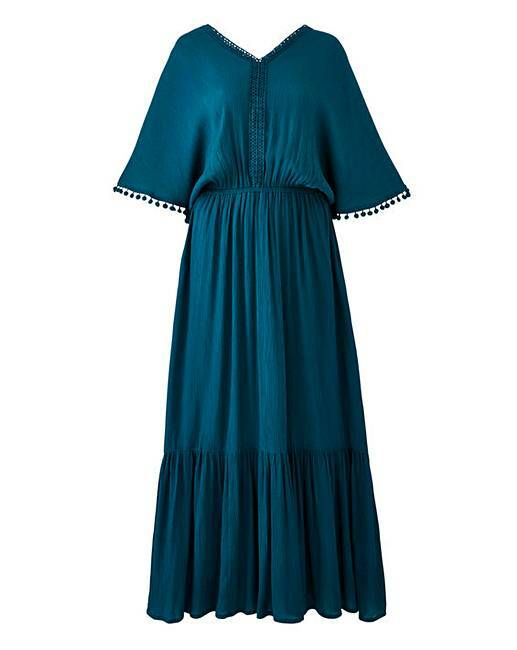 The colour is lovely and the cut is perfect for a modest, yet very boho, summer dress. My only concern is the thickness of the material: it's is fairly thin. For the price you pay, you don't expect to have a see-through dress when in any light path. So remember to have a layer underneath so there's no embarrassing moments. Rated 5 out of 5 by Freckles from style is very flattering. I bought this for my holiday, perfect for the evening. Very pretty colour.